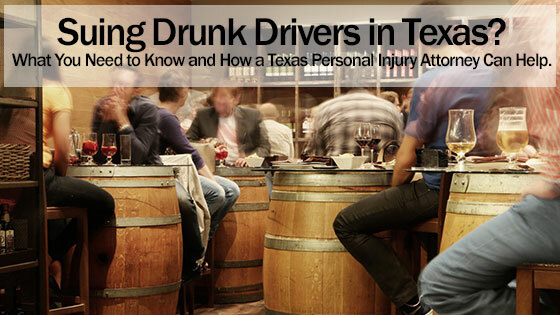 Home » Blog » Suing Drunk Drivers in Texas? What You Need to Know and How a Texas Personal Injury Attorney Can Help. Suing Drunk Drivers in Texas? What You Need to Know and How a Texas Personal Injury Attorney Can Help. Being involved in a car accident with a drunk driver can impact your life in a number of negative ways. In the state of Texas, if you have been injured after being hit by a drunk driver, you have a legal right to hold that person accountable for your injuries, pain and suffering and other damages. Speaking with a skilled personal injury attorney might be your wisest course of action in this situation so that you can more easily get a personal injury lawsuit started. Your lawyer will fight for your rights and will see to it that you receive the compensation you deserve. Your attorney can also inform you of your rights when you have been injured by a drunk driver in Texas. Although driving under the influence (DUI) is a crime in Texas and elsewhere in the United States, the driver who hit you doesn’t necessarily have to have been arrested in order for you to file a personal injury claim against them. All that is required is that you can prove the other driver’s negligence based on the details of the accident itself. Additionally, a personal injury claim is a civil matter and does not require an arrest. However, if the individual has been arrested, there may be a criminal case against them as well. Regardless of whether there are criminal charges pending against the drunk driver who hit you, you have a legal right to recover compensation to cover the costs of your medical expenses, any ongoing treatment, vehicle damage, pain and suffering and lost wages. The reason an injured plaintiff must take civil action and file a personal injury suit against a drunk driver is that criminal law is only in place to punish the drunk driver. The civil justice system exists to compensate victims. You also have to file a claim against the other person’s auto insurance company, which is one reason why having an attorney on your side is so essential. A personal injury lawyer has the knowledge and experience needed to deal with the insurance company and will ensure that you get an amount that is more than fair. When a person is charged with a DUI, they will be arrested and can face a prison term, probation, fines and other penalties. Additionally, if another person was injured in an accident caused by the drunk driver, police reports and a subsequent investigation reflects that the individual responsible for the accident was under the influence of alcohol. This can speed up your claim with their auto insurance company, which differs from an accident with a driver who was not drunk. Whether you were involved in an accident with a drunk driver as another driver, a pedestrian, a cyclist, motorcyclist or even as a pedestrian in the same vehicle with them, you have a right to recover compensation. Making a claim against the drunk driver’s insurance company. If you have been injured in an accident with a drunk driver, call our law offices today at any of our convenient locations and get a free consultation. Drugged Driving Accidents are Increasing and a Car Accident Attorney Explains How That May Affect Your Auto Accident Case.